This newsletter includes three recent engagements I had at schools, from an Earth Day keynote and art installation in a university in California to an architecture class and mural project at a high school in Vermont. As an alum of Holderness School in New Hampshire, I was also featured in their last magazine. I hope you enjoy the articles, images and video! I encourage you or your school, organization, or business to invite me to lead a workshop with your group. These focus on expressive mask making, reconnecting to nature, stilt walking and A Little Farm Story, as well as multiple Art of Sustainability workshops. I also encourage you to consider my art pieces - paintings and sculptures - and my book, A Little Farm Story as spring gifts for loved ones. Earth Day Keynote and "The Waste Stream"
For Earth Day, I was invited to Humboldt State University in Arcata, California to deliver a talk on my "Art of Sustain-ability" approach and to co-create an installation with students to raise awareness about the plastics flowing through our lives (and into the ocean). I am grateful to organizers and to the Humboldt Energy Independence Fund for making my participation possible. Read my reflections, view images and download my presentation. Difficult Beginnings combines oil paints and burlap on canvas. It is 72"x54" and framed. There's More To This is acrylic, fabric and paper on canvas. It is 30”x40” in size. Contact me at jay [at] jaymead [dot] net to purchase this or other paintings. I recently had the pleasure of working with 20 high school students at The Sharon Academy here in Vermont. I led an inward-looking mural project called "Humanizing Skin" in which students created colorful, life-sized plywood self-portraits. In my architecture class, students designed both a fantasy treehouse and an artist-in-residence cabin for possible construction at the school. View example mural images and a summary video of the architecture class! 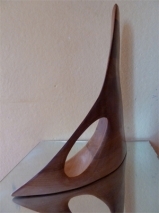 Wind Form is carved from laminated mahogany. It is 24"x23"x6" in size. Contact me at jay [at] jaymead [dot] net to purchase this or other sculptures. My alma mater, the Holderness School in New Hampshire, interviewed me and wrote an article about my career entitled "The Art of Well-Being" in their Winter 2014 magazine. Read the full article here. Copyright © 2014, Jay Mead, all rights reserved.